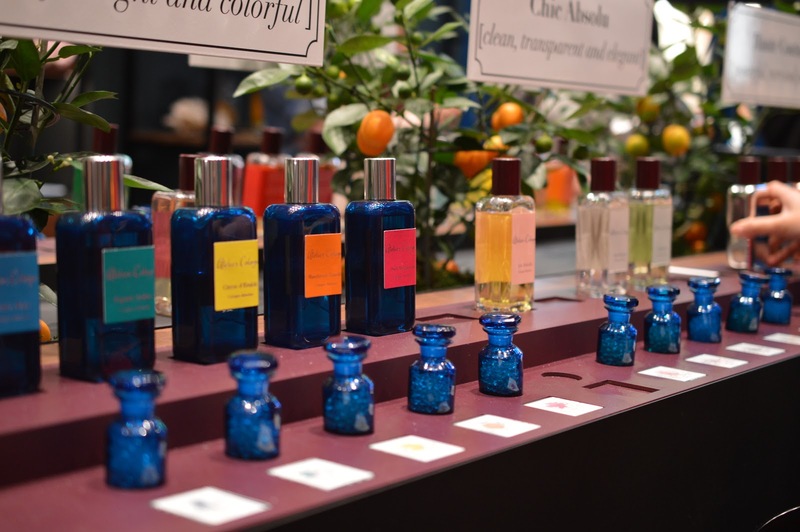 Each year L'OCCITANE releases the most lovely gift sets, which never disappoint. From Christmas crackers to ornaments, beauty advent calendars to $200+ gift boxes, there's a gift to fit any skincare lover's needs - and at every budget. This year, the entire look and feel of the collection has gone in a new direction. 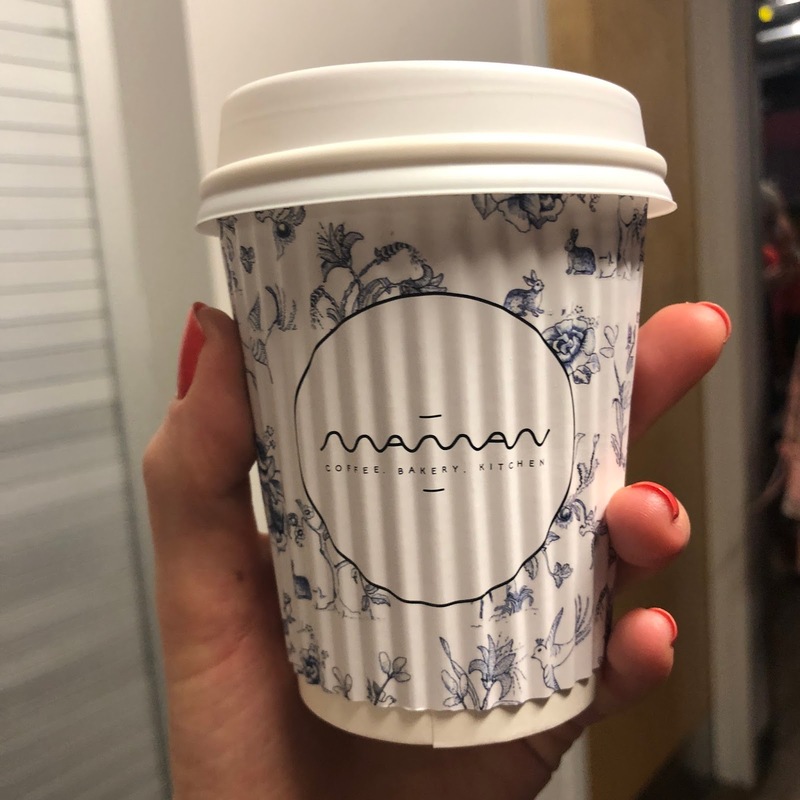 The brand partnered with fashion designer Jean-Charles de Castelbajac to create whimsical packaging that's less frilly, and more fun. 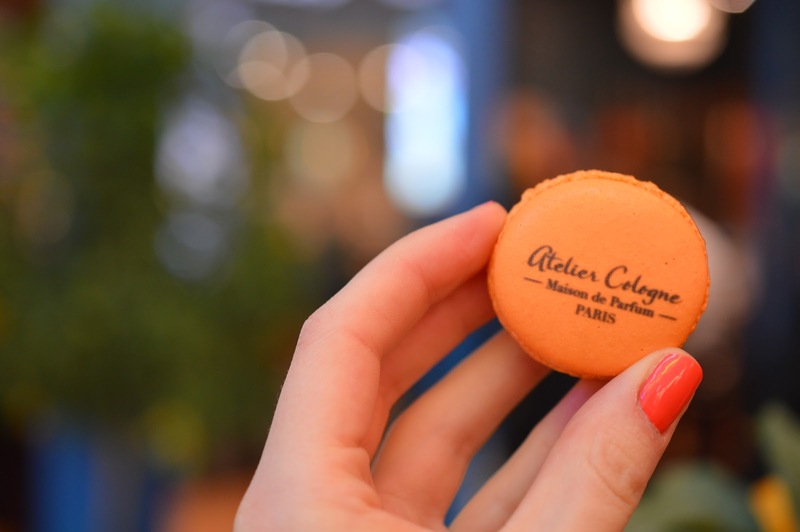 Here are my favourites from L'OCCITANE Holiday 2018 along with some highlights from the launch event earlier this fall. There's nothing sweeter than being able to shop for all of your daily essentials in one place, online, and all from the cozy corner of your own couch. 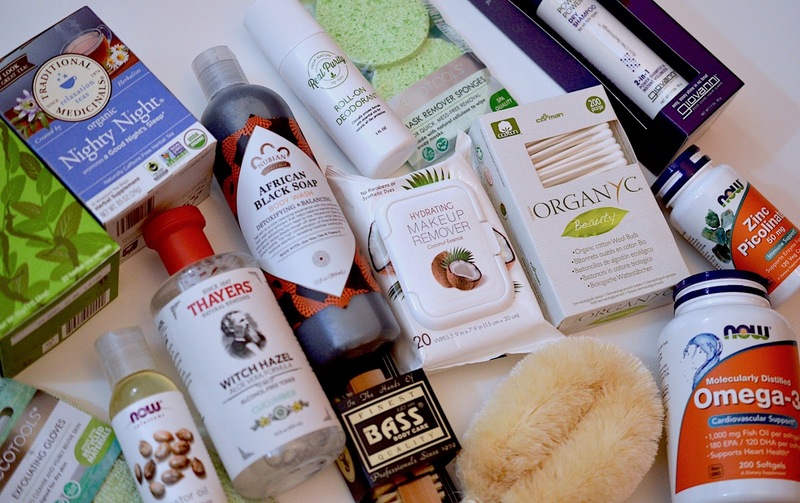 That was my experience shopping from iHerb, and I've already compiled quite the wishlist for my next haul. I love online shopping especially because a lot of my favourite organic and natural brands aren't readily available in Canada. Fortunately, iHerb carries over 7,000 bath and beauty products that can be shipped to over 150 countries. They also have an amazing customer service team to provide support in 10 languages. 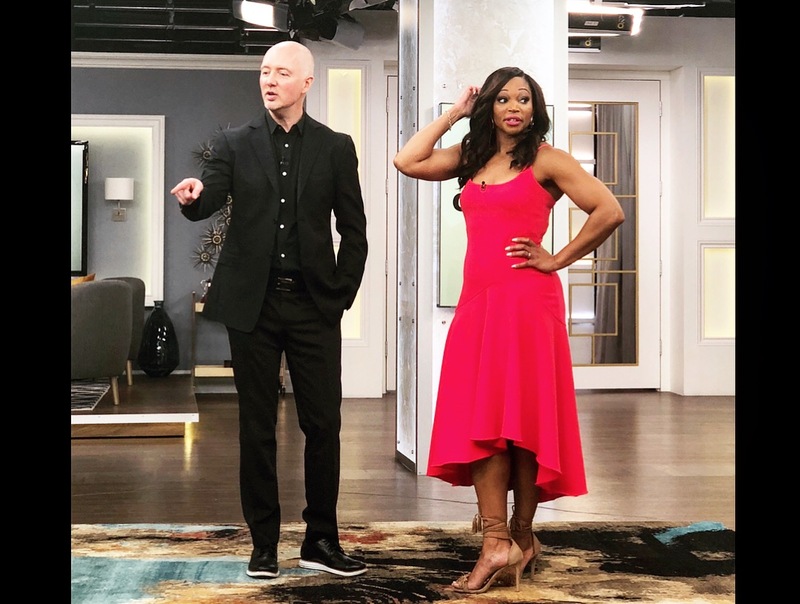 I had a super smooth shopping experience with them recently and have been itching to share my top 10 tips with you for mastering the art of beauty sleep, using everything I bought. Newsflash: I am still looooving Revlon you guys. 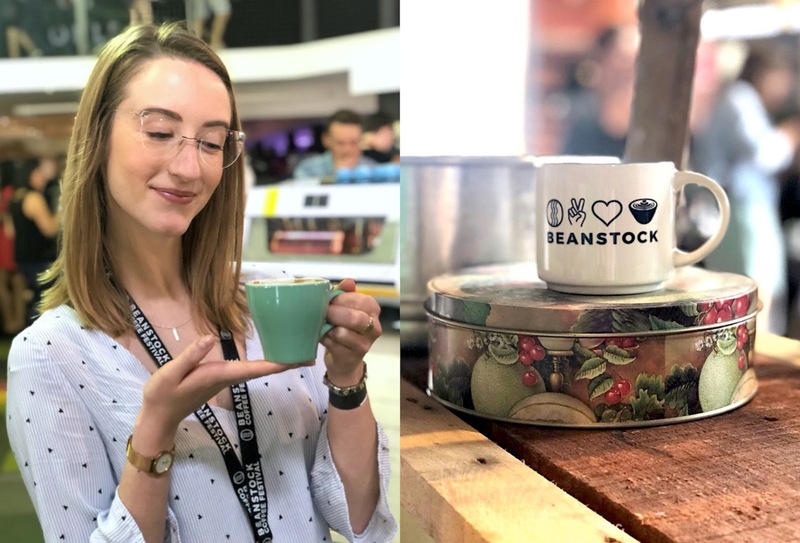 A whole bunch of their newest products caught my eye recently, so I wanted to try them and share my thoughts with you. There's no doubt about it, winter is just around the corner. I like to stay cozy and warm at this time of year by wearing warm scarves and knit sweaters. In addition to dressing up, I love wearing makeup and perfume to boost my mood when the weather turns frightful. Here are 4 fragrances, 3 for women and 1 for men, that I would highly recommend trying out this season. Though it is mid-September, the sun hasn't gone away yet. This weekend in Toronto will be in the mid-twenties, so I'll be showing some skin and soaking up the final rays of Summer 2018. That being said, I always try to wear sunscreen when I'm outside for more than 20-30 minutes to avoid sun damage. I don't work as a lifeguard anymore, so I go through sunscreen really slowly. 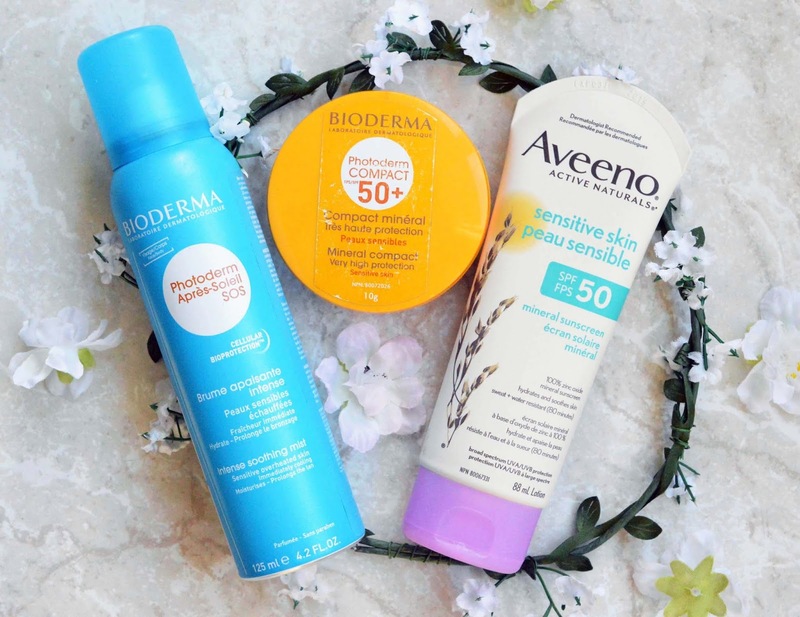 I think the options at the drugstore have greatly improved over the past couple of years, so here are my very top picks. 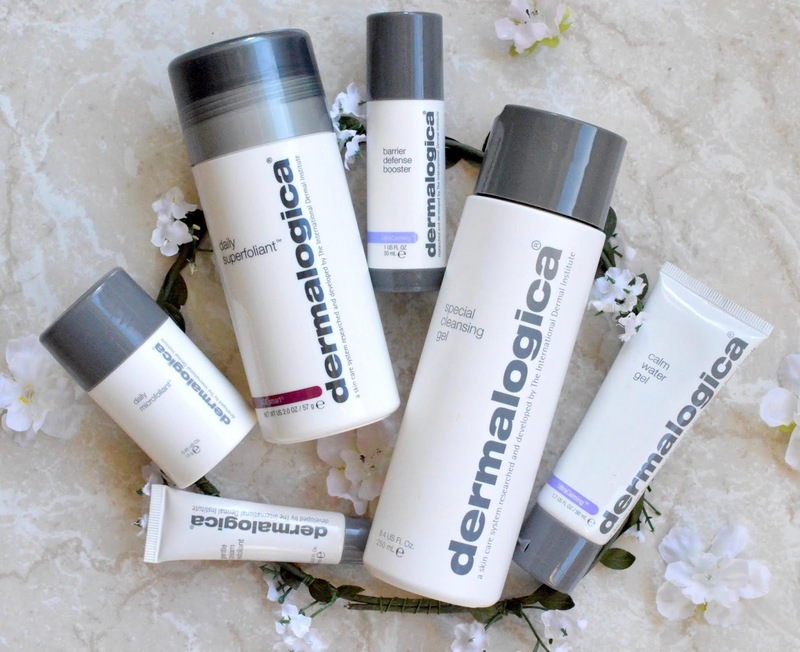 Dermalogica is a famous skincare brand, known around the world for their minimalistic packaging, clear motives and no-fuss formulations. Their products are expensive, and I find that to be a bit intimidating sometimes so I don't always buy from their collection on a whim. What you should know is that all of the products I have tried are really good- they use great ingredients, boast enticing names and I find that the products themselves are quite long-lasting. As I have sensitive skin, I'm drawn to brands like Dermalogica who don't use artificial colours and fragrances in their skincare. They also have this great website called skinsensitivityrisk.com where you can check in on your skin's status - understanding what factors may trigger breakouts and redness. Almay as a brand always transports me back to high school. They've been a reliable brand for affordable makeup options at the drugstore for as long as I can remember. With products subtle enough for a school uniform, and gentle enough for my sensitive skin, I'm always interested to see what they have coming out next. 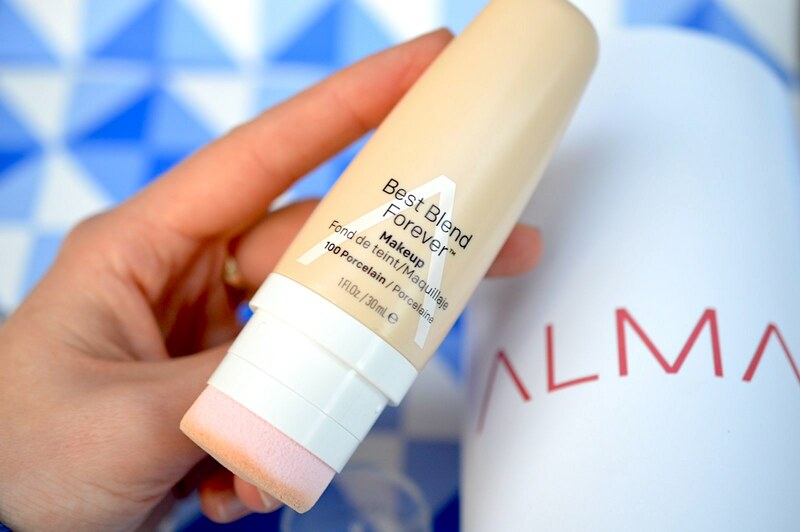 The new Almay Best Blend Forever Foundation is an incredible daily base available at the drugstore right now, for a multitude of reasons. The packaging is sleek, the foundation is easy to use, and it offers a finger-free application via the sponge top, perfect for on-the-go makeup. As a long-time Paula's Choice fan, I'm always game for trying something new from the brand. I've been very loyal to Clinique for my masks in recent years, so it's hard for other brands to stack up. These two Paula's Choice masks aim to clear pores and rehydrate skin, both of which I need on a weekly basis. I'm going to try and mask every time I workout, which is 2-3 times per week, so I'll update you on if that happens and how it's going in the upcoming months. Now, on to the PC review! So I haven't been VIB at Sephora for a while now, and I'm honestly very proud. I don't like watching my expensive makeup expire, so I try to maintain a reasonable stash while also indulging in a few fancy goodies here and there to aid in my reviews online. With this surprise Sephora sale (on now!) 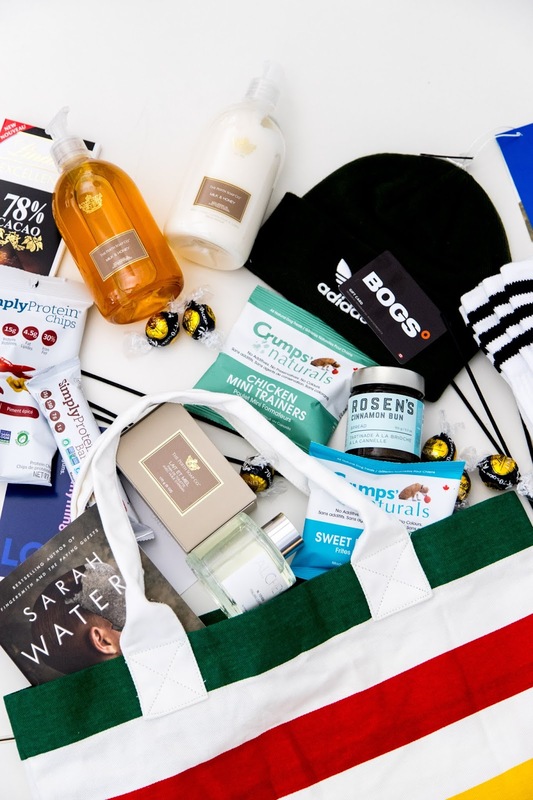 you can receive major discounts on all of your favorite products - and when you partner the 10-20% off with an Ebates discount, you're scoring even bigger. Here's a quick rundown on Sephora's membership program: If you spend $350 in a year, you're a VIB (Very Important Beauty Insider), and if you spend over $1,000 in a year, you become a Rouge member. During this sale, Rouge members will receive 20% off all products in store and online with the code YESROUGE, starting August 29. All VIB and Beauty Insider members can start shopping the sale on August 30. 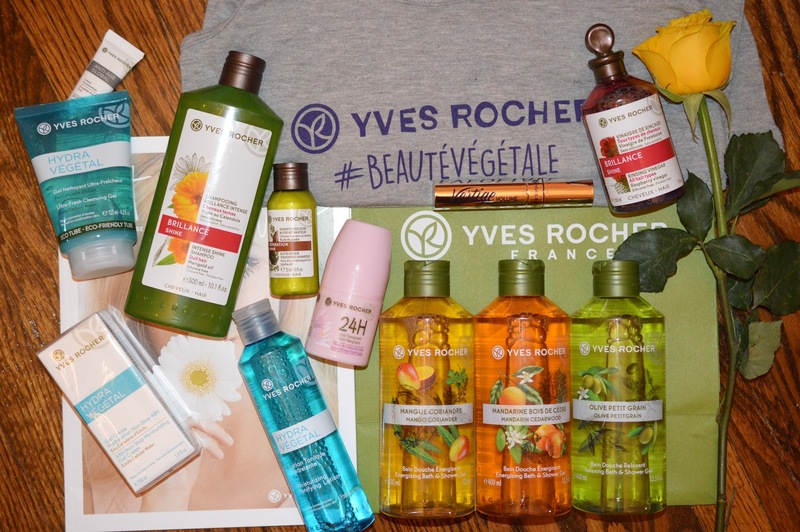 (VIB members will receive a 15% discount with code YESVIB, and if you're an insider, you'll get 10% off with code YESINSIDER.) This sale runs until Sept. 3, so I wanted to share a few of my favourite products at Sephora to help fill your basket. Dr.Belmeur is a skincare line by THE FACE SHOP formulated with no ridiculous chemical additives or artificial fragrance. Dermatologically tested, this line provides gentle skincare and barrier-enhancing solutions to treat common skin problems such as dry, sensitive, and acne-prone skin. Dr.Belmeur’s custom-made formulas offer simple solutions to incorporate into your daily routine. Thanks to ChickAdvisor I was able to try the Advanced Cica Recovery Serum, Recovery Cream and Panthenol Soothing Gel Cream - and loved all of them. Do you use Mary Kay cosmetics? As they are a 55 year old company, I feel like we've all dabbled into their skincare or makeup at one point in our lives. 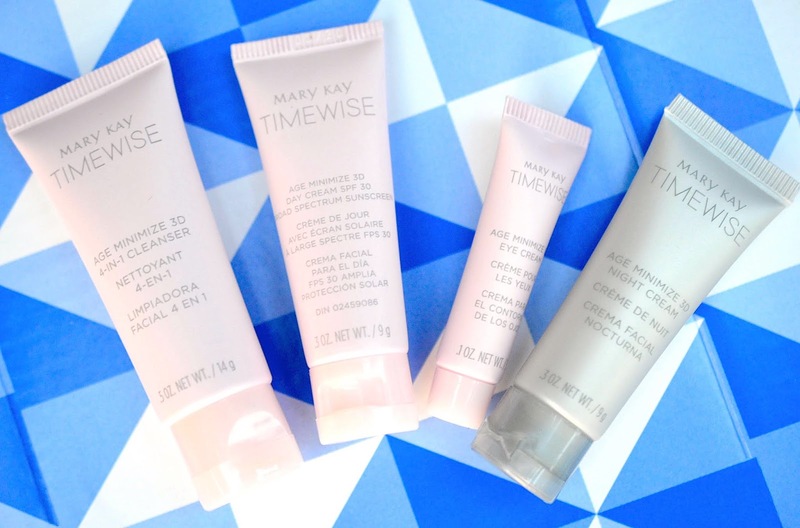 With millions of salespeople worldwide, Mary Kay is clearly making great products that have withstood the test of time. This is a multi-level marketing brand that is promising results, and delivering on them. 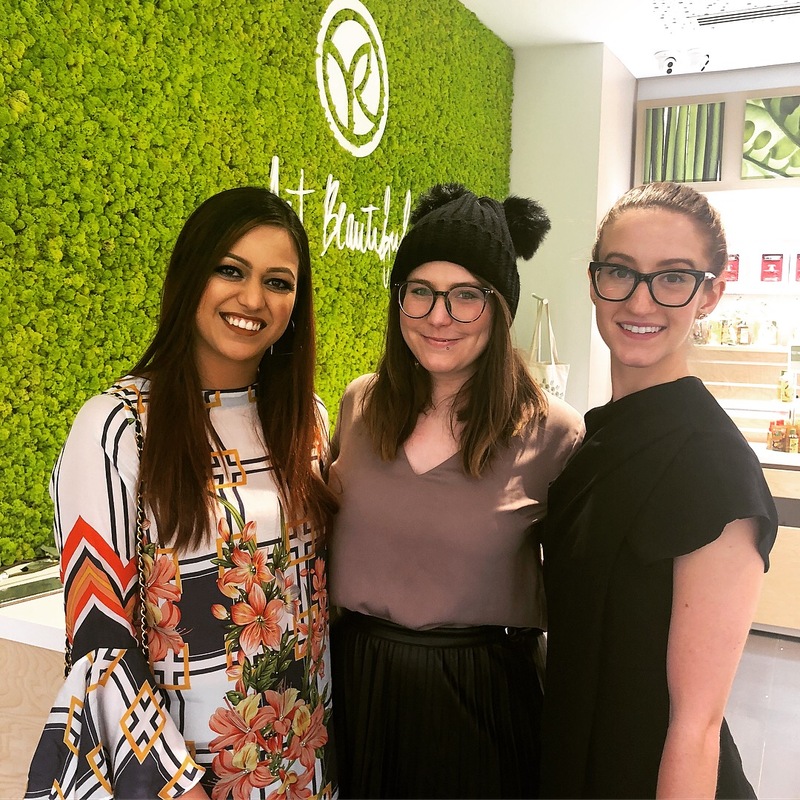 I was recently invited to a re-launch party for the TimeWise skincare line which took place at Her Majesty's Pleasure in Toronto. This was the most memorable event of 2018 for me, and the products themselves have really impressed me so far. If there's one beauty treatment I won't pass on, it's doing my nails. I adore a little at-home mani, and I've been lusting over Essie's newest shades this summer. I have a big selection of favourites here, all of which are extremely flattering on the nails. I was most surprised by the opacity of these shades, most needing only 2 coats to achieve a streak-free application. Read on to see how I use these stunning polishes. Edens Garden is an amazing natural brand, they have home and beauty products that are so high quality, and don't have outrageous pricing just because they're "green". I find that their objectives are in the right place, providing us with beautiful and special daily essentials that are infused with 100% pure essential oils, promising to uplift, cleanse and refresh with ease. Here's my review from January where I chatted about their diffuser and oil blends. Today I want to introduce you to their new solid bar soaps, which look totally scrumptious and smell better than you can believe. 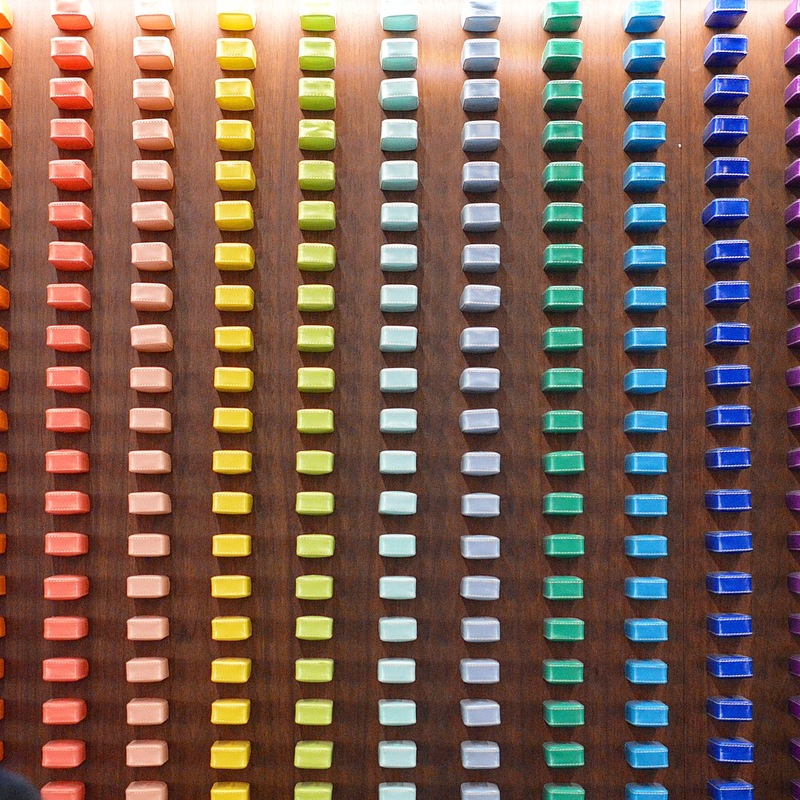 Read on to see which scents they offer. 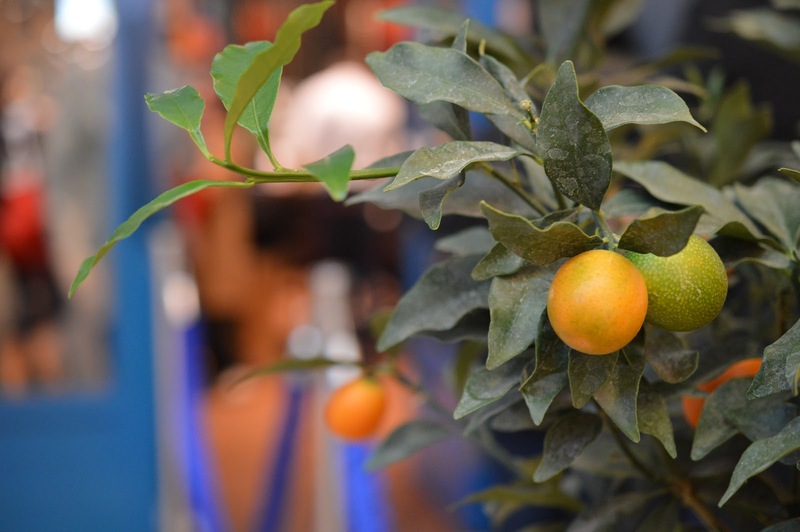 Reaching the extremes in weather, routine, stress etc. can totally throw off the health and quality of our skin and hair. Everything runs in sync where lifestyle and body are concerned, so I always believe that a good self-care routine leads to a happy, positive outlook on life ahead - and increased health overall. Even though summer time is generally fantastic in all regards, intense sun, stifling heat and a busy schedule can leave us feeling burnt out - literally. 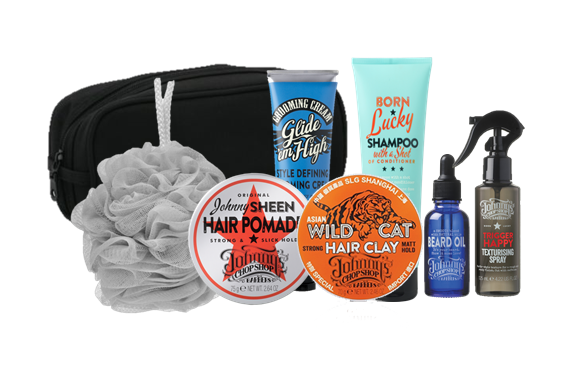 Here are some products to make the last bit of your summer as amazing as possible, helping you take control of your hair health, quicken the length of your showers, and protect your skin from the elements. When I'm buying makeup for myself now, I have simple rules: high-end foundation and concealer, low-end liner and mascara. High-end eyeshadow, low-end blush and bronzer. Lippies can go either way. 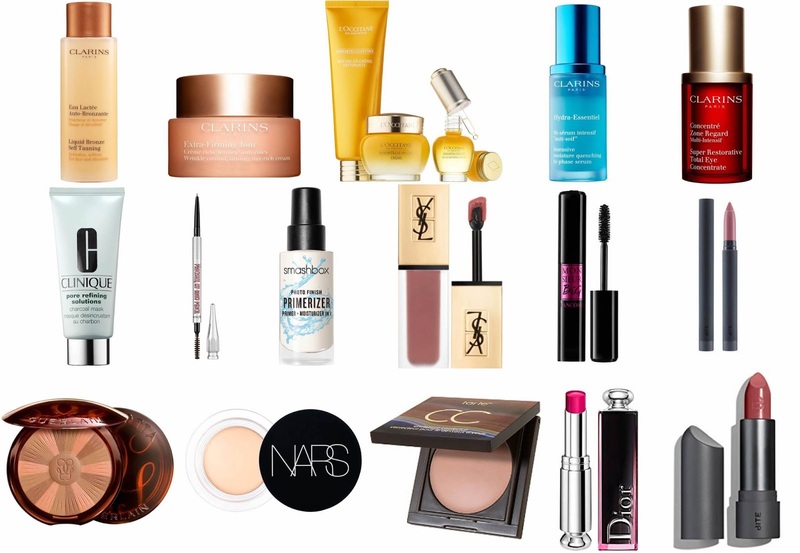 I have a tooon of makeup, more than I need, but I still love trying products from all ends of the spectrum since I know you can find awesome dupes at the drugstore for your favourite $ephora finds. 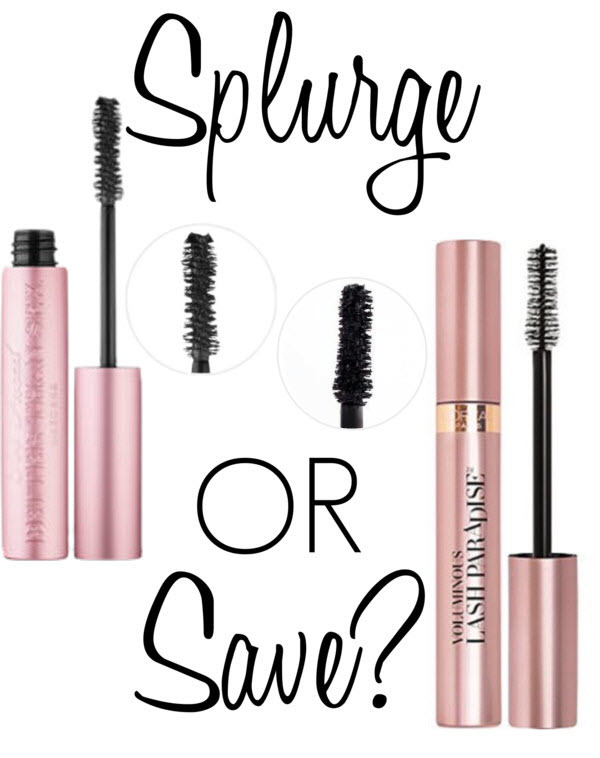 Physicians Formula is a brand that is readily available at the drugstore, but the regular price of their products are literally Sephora worthy. So which of their beauty buys are actually worth it? I have been hearing about their Matte Eyeshadow Quads on YouTube from bloggers like MsGoldGirl, and couldn't help but try them all out when I received a 50% off coupon at Generation Beauty last year. Dove doesn't always come top of mind when I'm shopping for pamper products, but they are definitely a go-to brand for affordable body washes and soap bars when I want something that's gentle on the skin. Their new collection of "Body Polish" exfoliating scrubs are unique and very lovely overall. I received mine via the Topbox Circle review club and haven't stopped using it due to the expensive-feeling experience, luckily available to everyone of all budgets. On July 26th over 4,000 people gathered at the Exhibition Place in Toronto for The 6th edition of the LOLË White Tour, produced by evenko. In a sea of yogis all dressed in white, we celebrated yoga, wellness, hope and equality with teachers Elena Brower and Megan Marie Gates. A few weeks ago I visited Raffaello Salon in Yorkville for a NIOSCOPE Derma Renew Hair Treatment. Christopher Marrello was so welcoming and helpful, explaining every step of the treatment in detail and standing firmly behind the NIOXIN products he used. The entire NIOSCOPE "Head Spa" was just over 1 hour, and my experience included washing, blow drying and styling. For me, summer beauty is all about efficient products that pull their weight and make life easier. Over the past few years, Farleyco has been my 1-stop-shop for affordable brands that don't mess around. 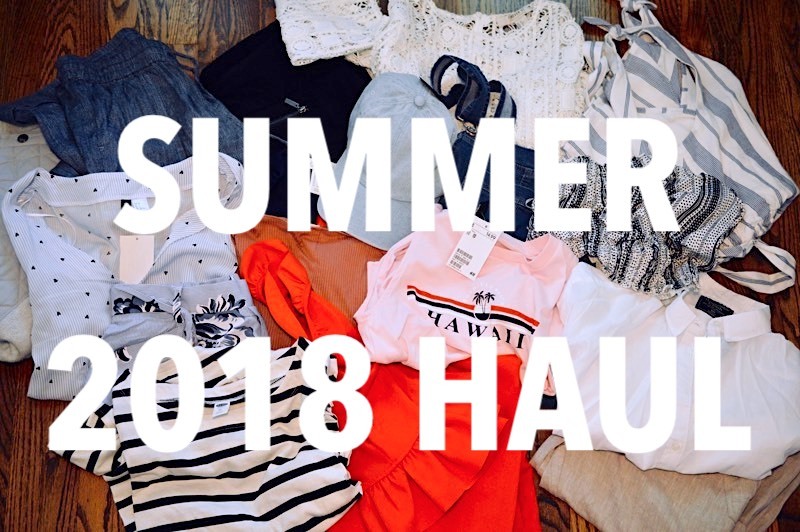 They're always stocking the newest and best from a variety of brands, so here are a few of my current faves that you can buy now. 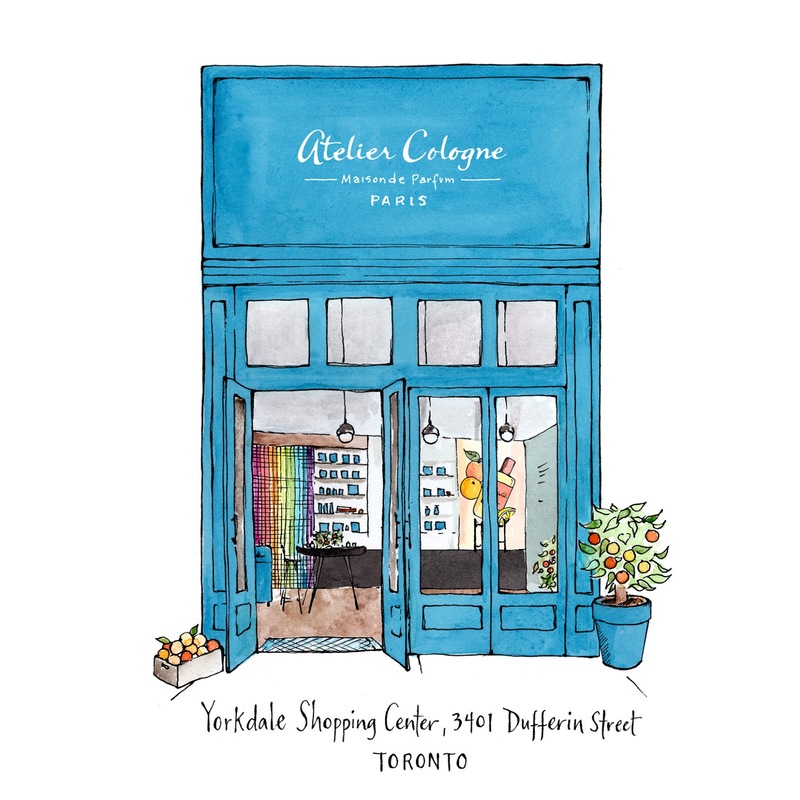 A few weeks ago I braved an April ice shower and visited the store opening of Atelier Cologne at Yorkdale Shopping Centre in Toronto. 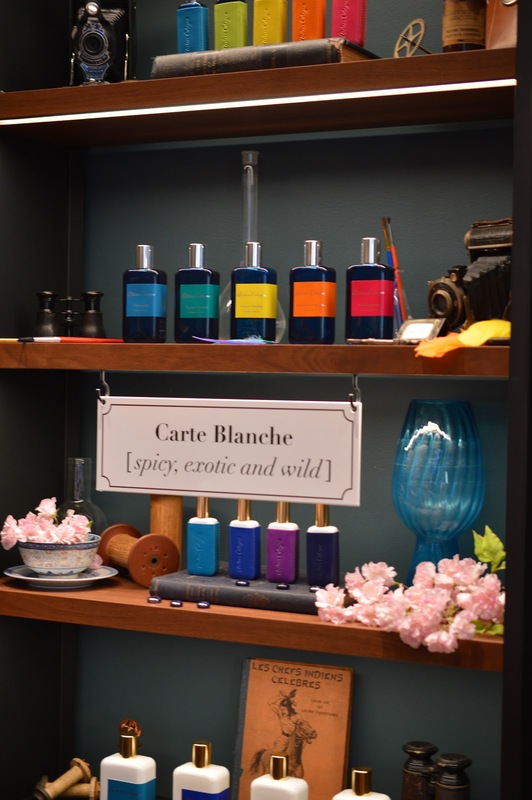 The store just oozes Parisian chic, no detail is missed and each product is simply divine. They had giveaways, discounts and freebies for the first 75 customers in line. Read on to see my purchases and (massive) winnings from the day. I’m honestly surprised I still have all 10 fingers because I’ve never gotten into a package quicker than with Clarins’ Sunkissed Summer 2018 Collection. Everything about it shouts perfection. From flamingo prints to vivid colours, this collection is a must for anyone needing a makeup bag refresh this year. I am reviewing the bronzer, 4-colour pen for lips and eyes, the makeup pouch and a lip comfort oil. This was such an amazing few weeks. From meeting legendary Lady H (aka Caroline Hirons on YouTube) to fun events with friends, I can't wait to continue enjoying spring and summer. Sun-In Hair Lightener Spray has been around since the 70's, and costs only a few dollars for some serious colour payoff. Having two older sisters and medium-blonde hair, we've stocked bottles of this lightening elixir in our washroom cabinets for as long as I can remember. 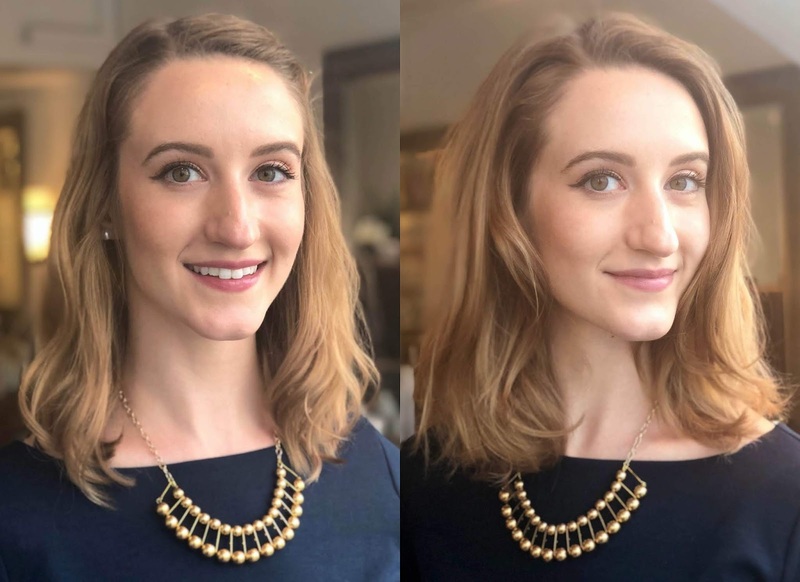 Sun-In gives you the same natural highlights you get from the sun - only faster! Their advanced conditioning system includes botanical extracts and special illuminators to give hair an extra dose of shine. This spray is alcohol-free, and you don't actually need the sun to get immediate results. 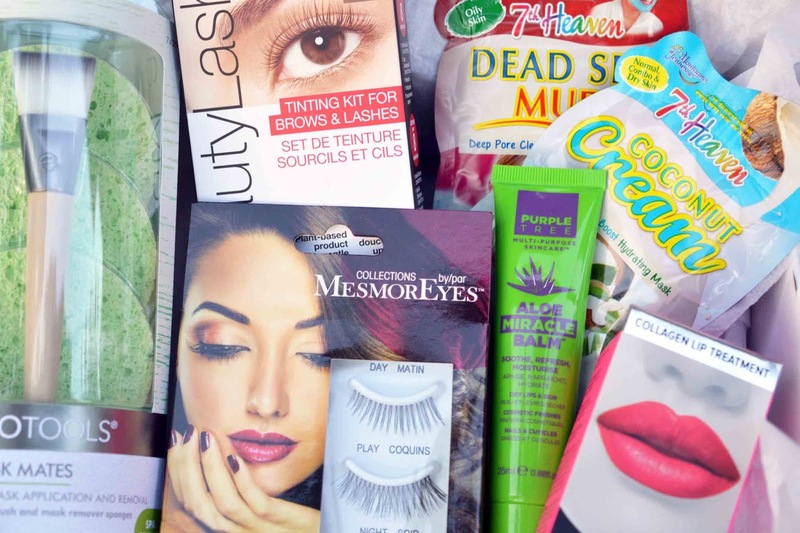 Influenster is a great program for makeup lovers, and those who enjoy reviewing products in general. My most recent product sent for review is the Kat Von D Super Brow Long-Wear Pomade in Medium Brown ($23 CAD), along with the Kat Von D #70 Pomade Brow Brush ($22 CAD). I have dark blonde hair and my brows are considerably pigmented, so this shade works great when sheared out. I've had an amazing month of April, it has probably been my best one yet! 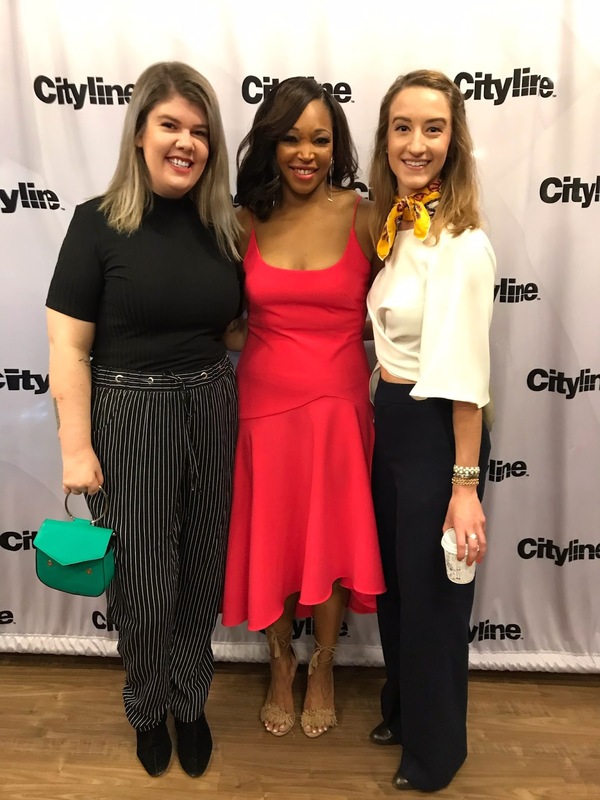 From seeing a Fashion Friday taping of Cityline with Dave Lackie and his Twitter family, to group dinners and store openings, I can't wait for the excitement to continue into May. Here are some highlights, which you can also see live in my vlog below. 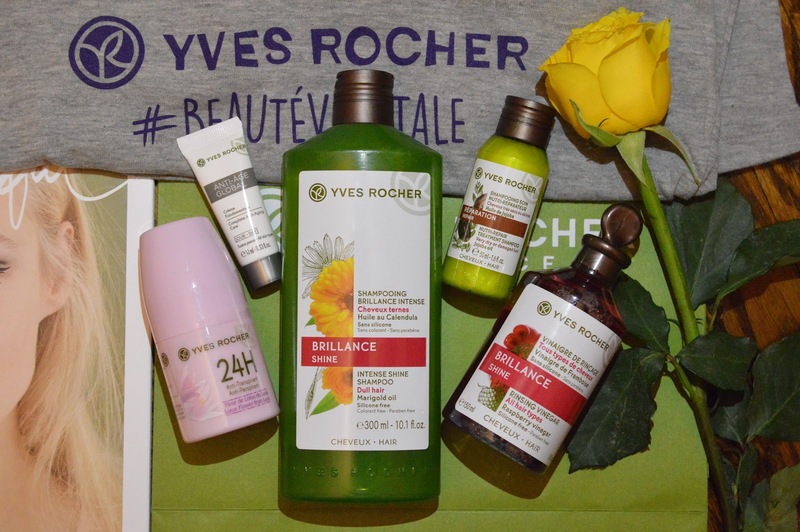 First up was the store re-opening party for Yves Rocher hosted by Anum from SummerxSkin. 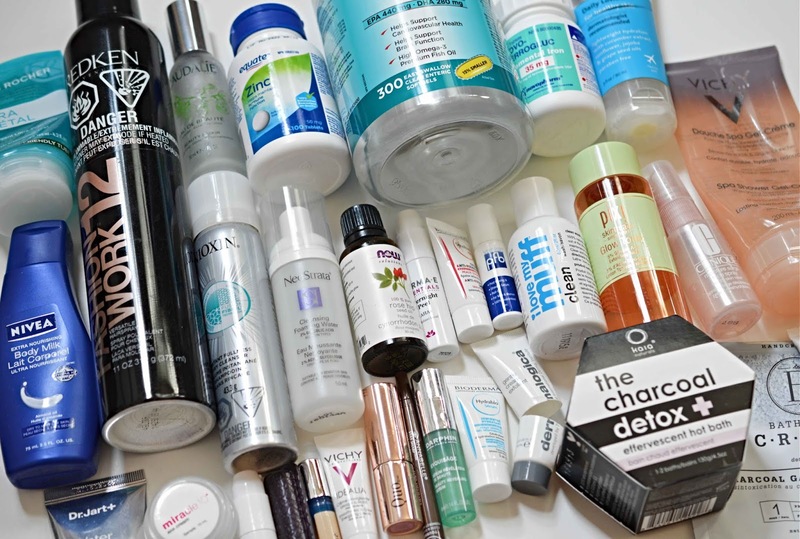 I loved this event, it allowed me to re-discover a brand that I've used only a handful of times before, and now it has become a staple in my routine. 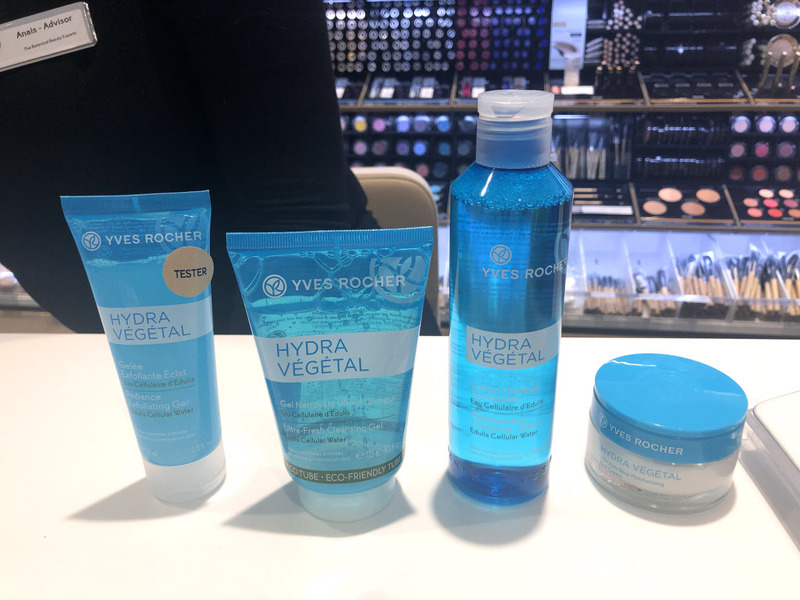 I received a large portion of the Hydra Vegetal line collection, which you'll see below. I'm enjoying the cleanser from Hydra Vegetal, along with the toner and moisturizer. 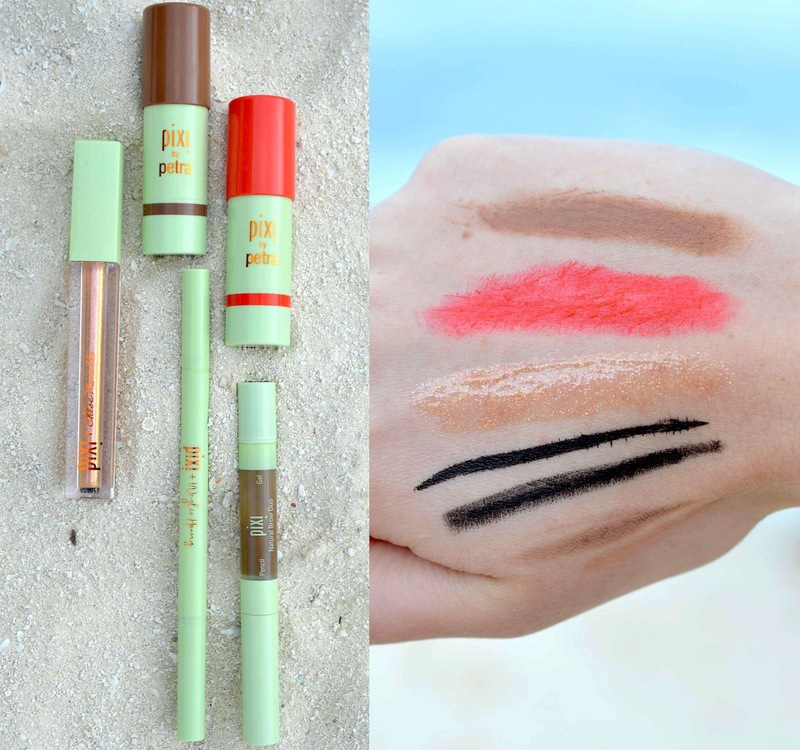 These will be extra good in the summertime, since they have a light, fresh feel on the skin. Less is more - don't over-use the moisturizer since it can feel sticky. 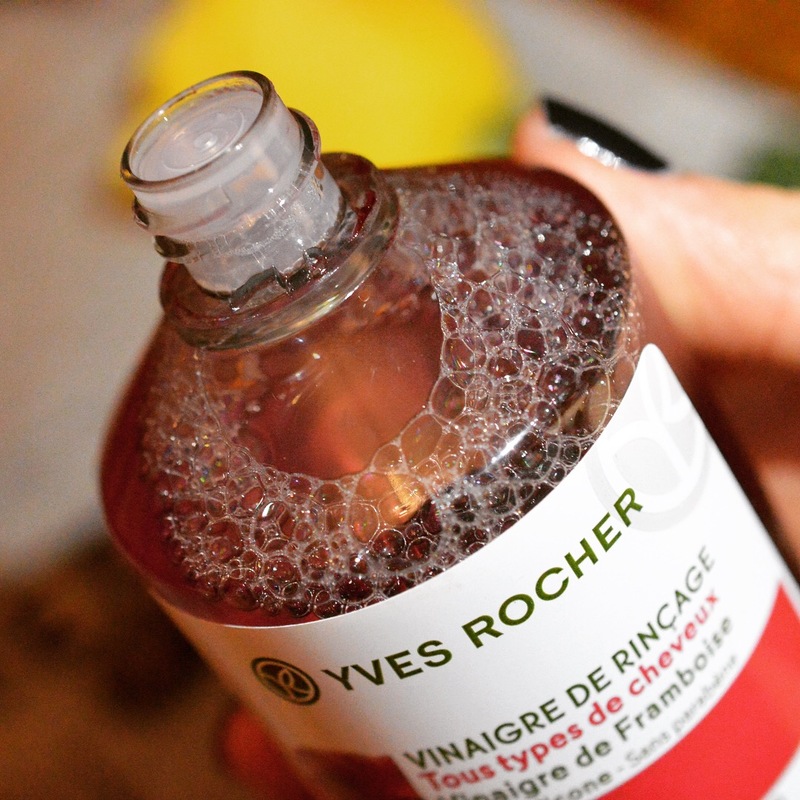 This vinegar rinse is super delicious smelling! I think it's a nice product to add into your routine, and it leaves my scalp feeling fresh. I can't say whether it has transformed my scalp yet or not, but I'll report back after more regular use. 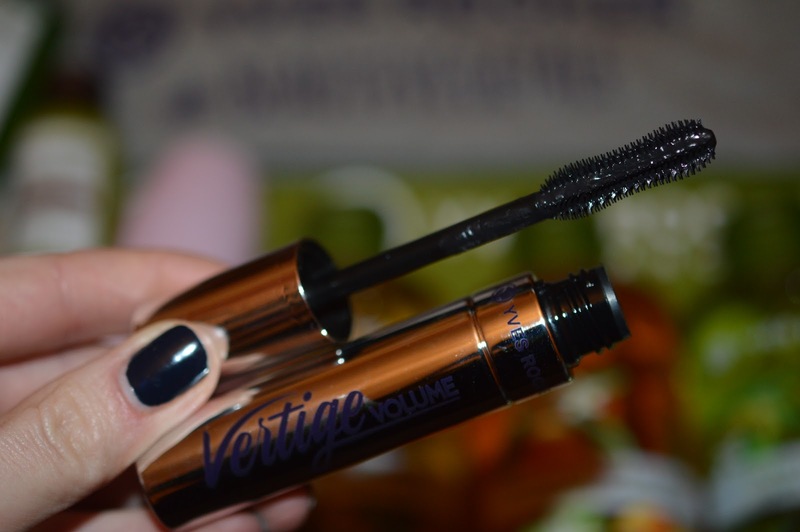 This mascara was a free gift with purchase, and I love it! the brush is rubber and quite stiff, but the product is so lengthening and doesn't smudge or flake off. 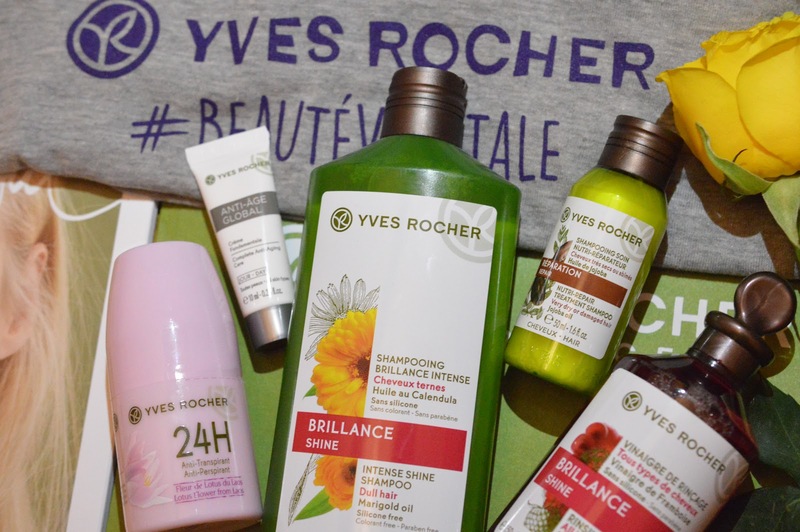 My favourite product from Yves Rocher has to be the deodorant. I have since bought 2 more because they're only $5 each! They're a cream formula and perform so much better than my usual Nivea roll-on. I'd recommend wholeheartedly, especially since the store always has a great promo going on for those with a membership card. The shampoo and shower gels are quite nice as well, the fragrances are lovely and they don't strip my skin. 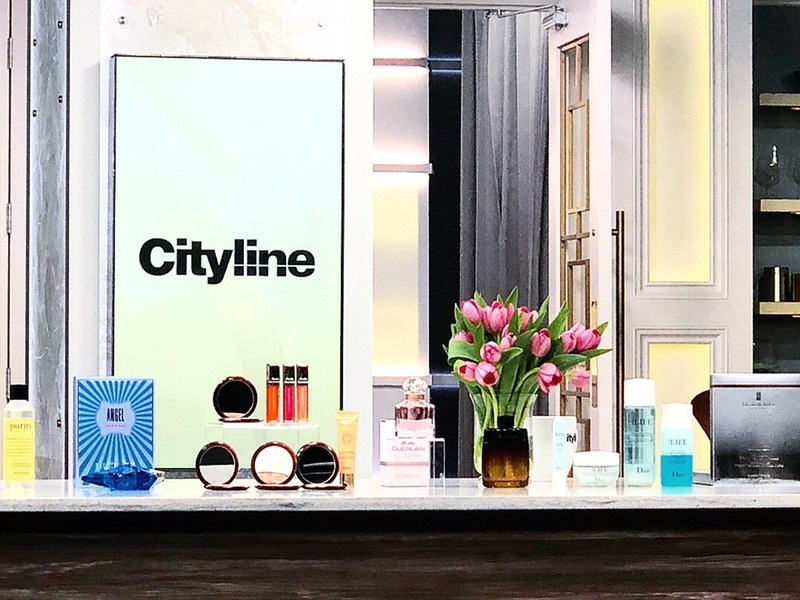 Now, to Cityline! Our morning began with incredible pastries and coffee/tea from Maman- a cafe I have always wanted to try in downtown Toronto. 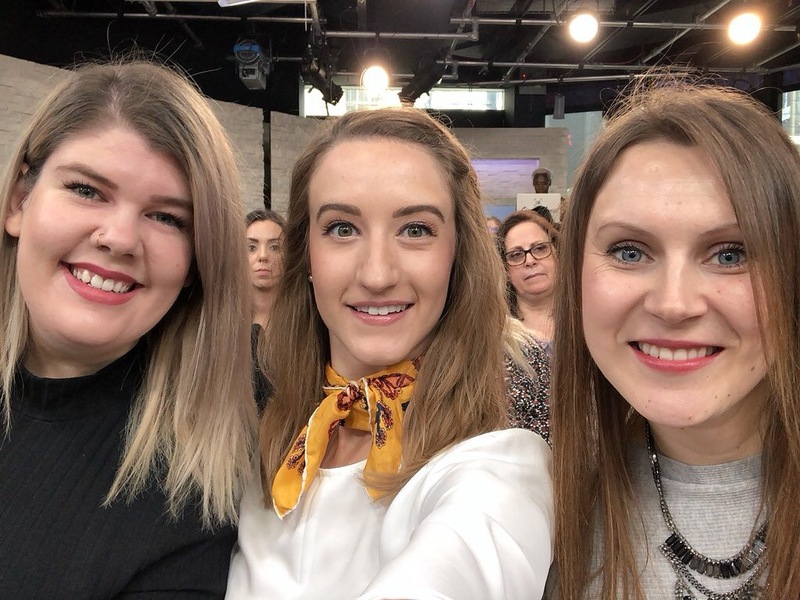 I sat between my blogger friends Brianne and Grieta as we watched the glorious Fashion Friday taping. One of the best parts of the episode was seeing all the new frames from Joe Fresh. They're beyond chic! 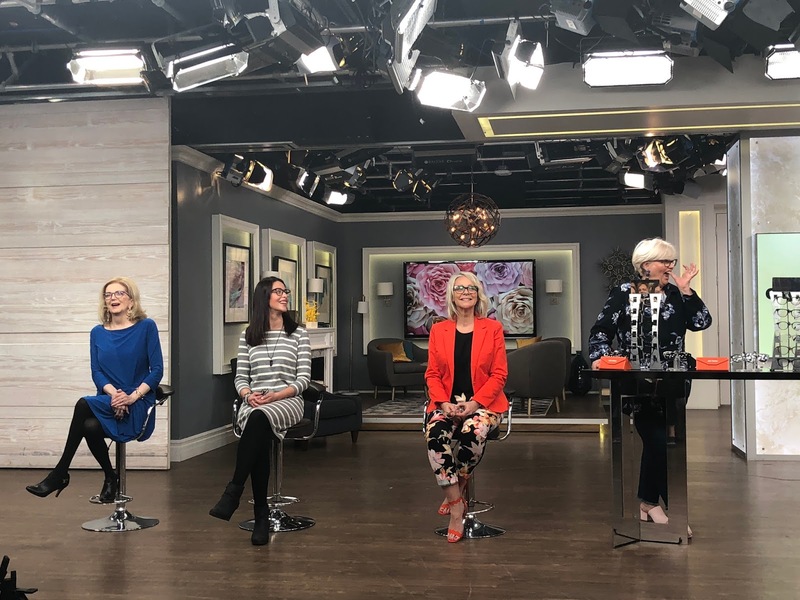 Watch the April 20th episode here to see how these ladies had their looks elevated with new glasses. Dave and Tracy looking fabulous as always!! Thank you for hosting us. 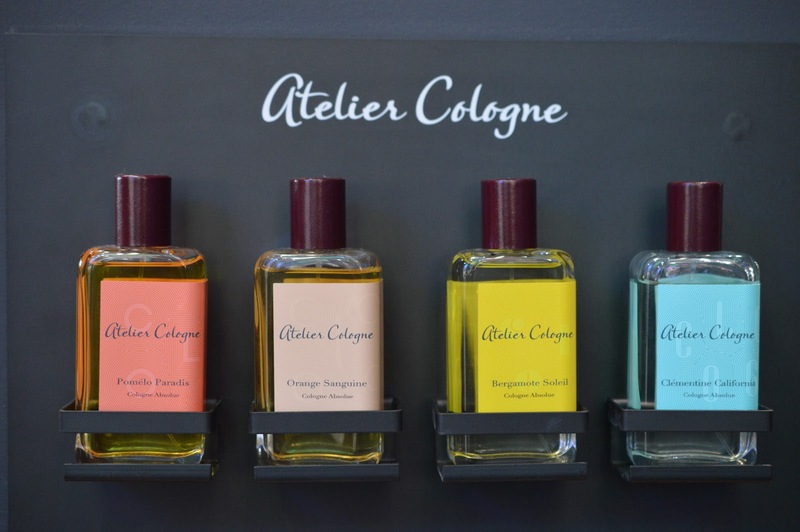 I visited the new Atelier cologne store at Yorkdale the following weekend to see what it was all about. 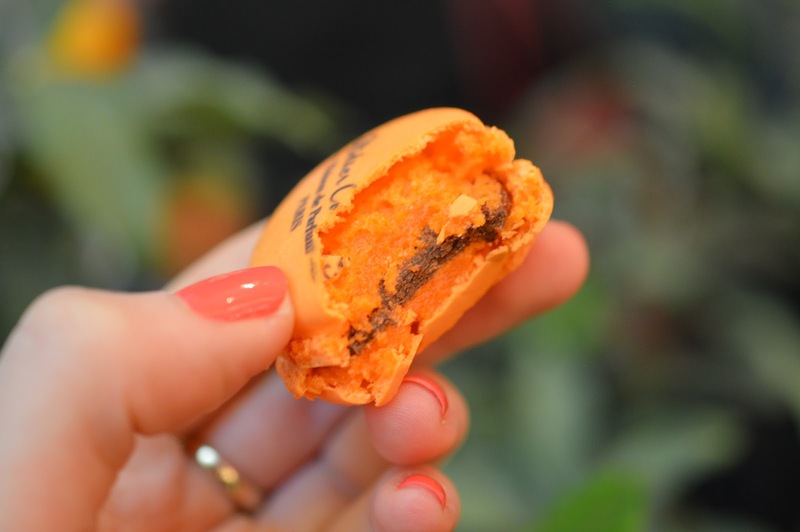 We enjoyed chocolate orange macarons and fresh citrus juice while waiting in line for the store to open. 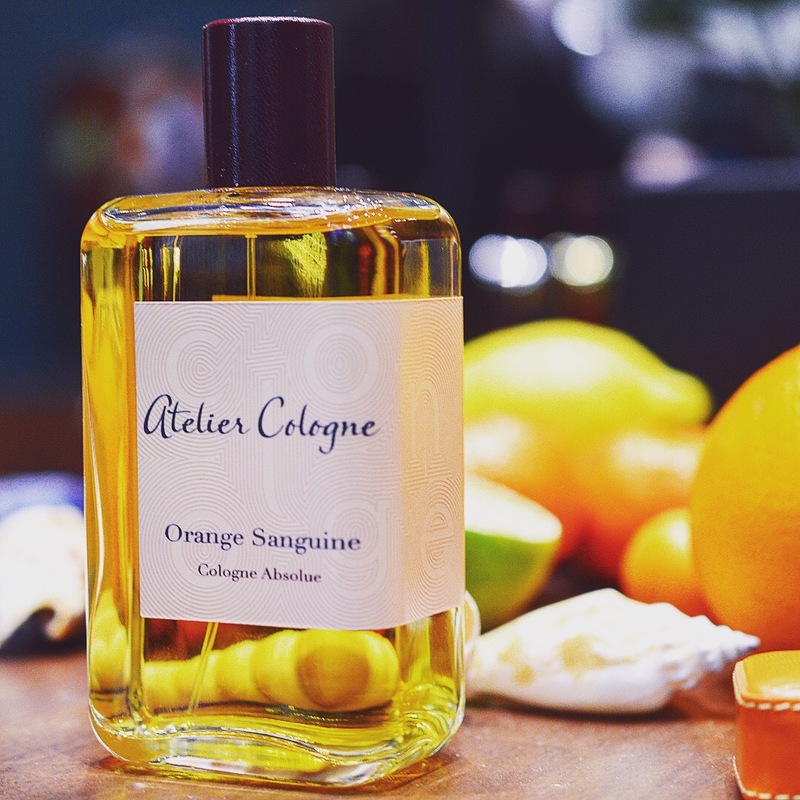 I've loved the Orange Sanguine cologne absolue for years, and the first 50 people in line received one of the 30ml bottles to take home. You will receive a small leather case to put over your 30ml bottle with select purchases in-store. The best part is that they'll emboss it for you with whatever saying you like! I'll post mine in an upcoming review. The whole store is simply divine. 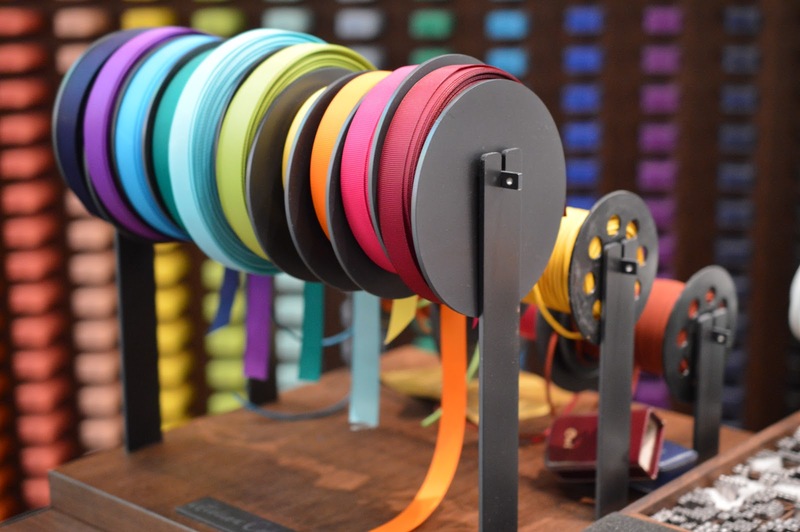 They also have incredible gift wrap, making Atelier Cologne your perfect one-stop-shop for all your gifting needs. 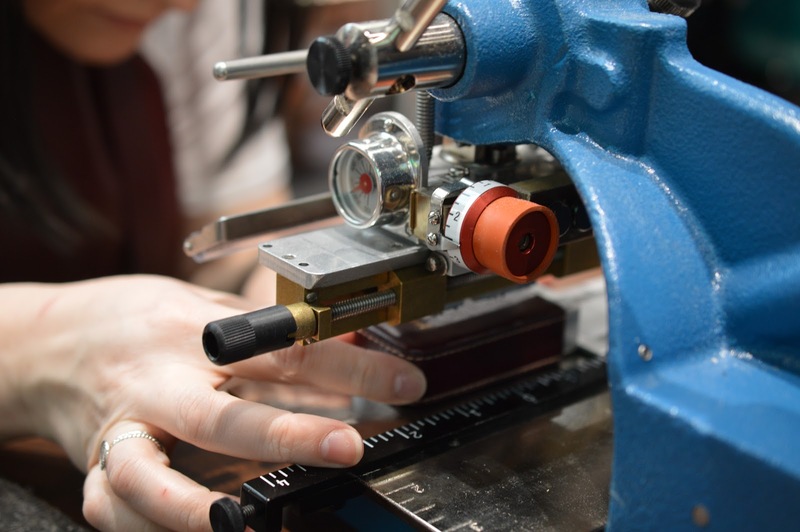 Getting my leather case embossed! Amidst the wild ice storm, my sister and I went to see Come from Away in downtown Toronto. 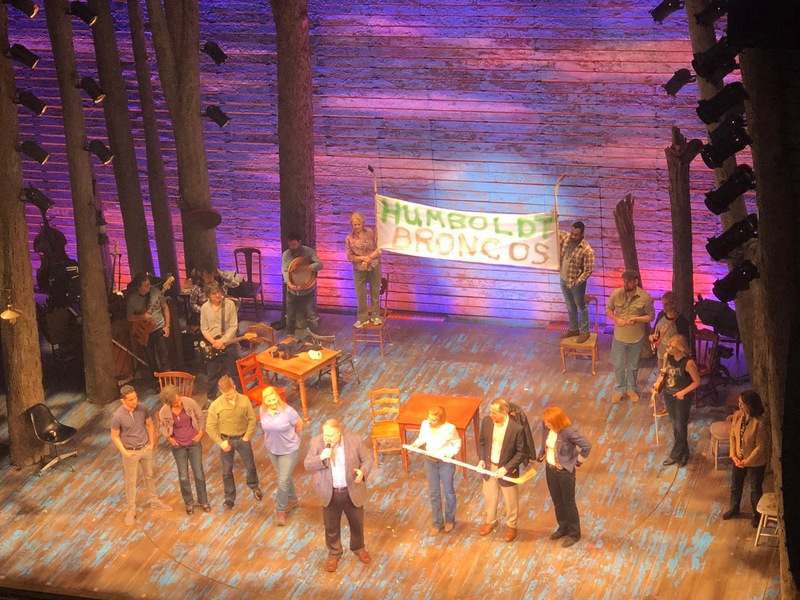 The show was outstanding, truly heartwarming to see the compassion that Canadians expressed in a time of crisis. 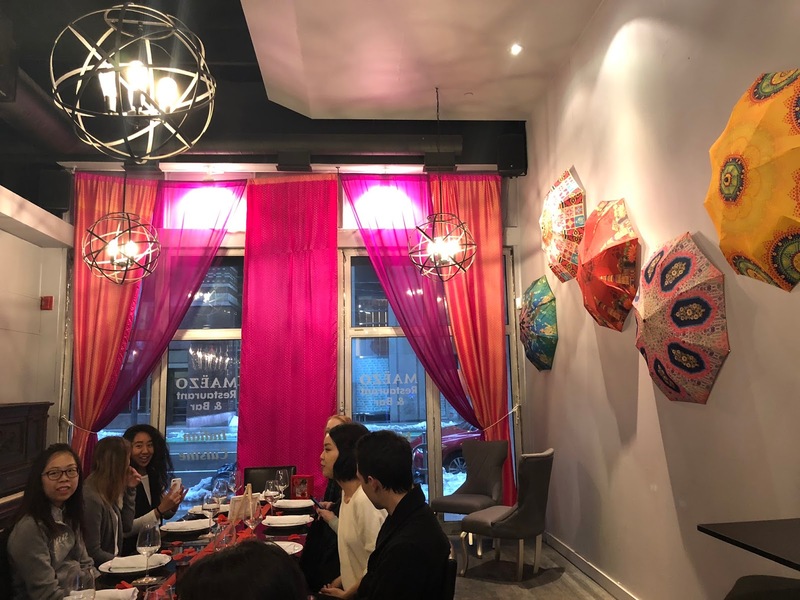 My Yelp Elite Toronto group had an awesome exclusive dinner at Maezo on Richmond St. 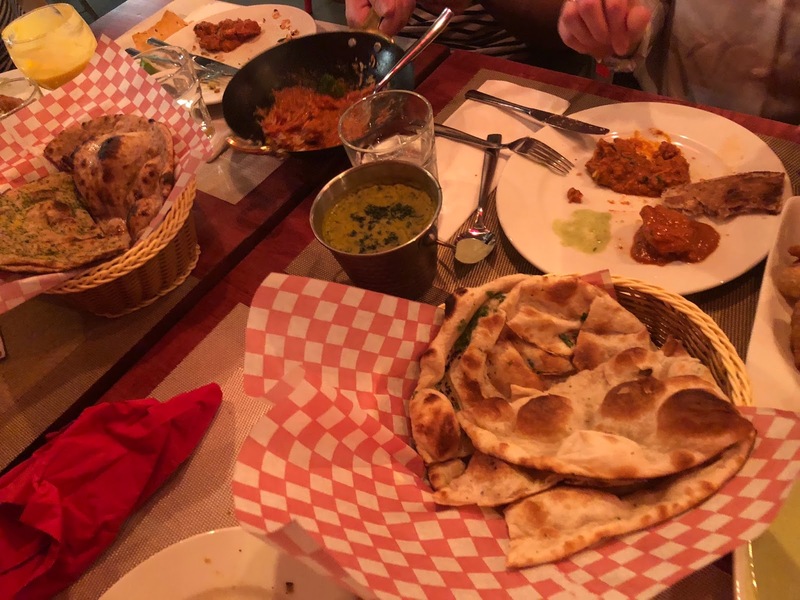 Both the food and company were wonderful. 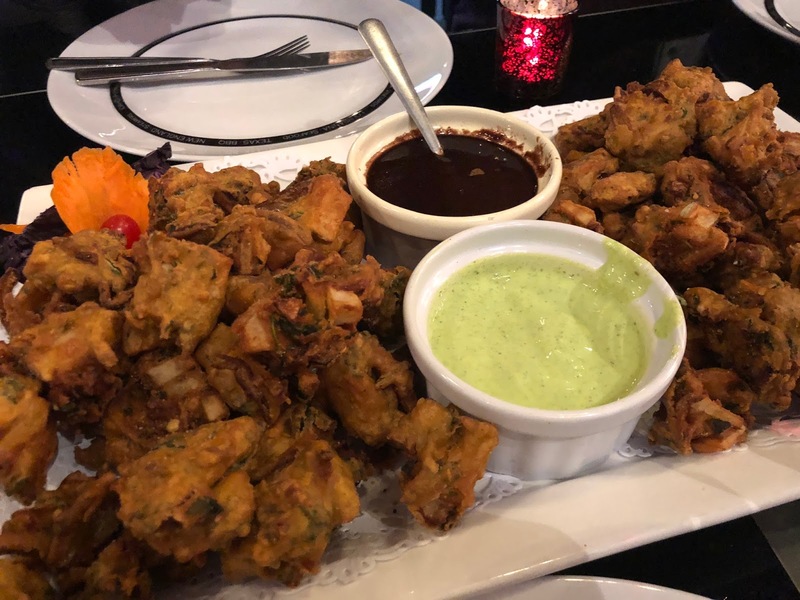 April was a month filled with delicious Indian food dinners, we went on a family outing to Khau Gully, located in uptown Toronto. 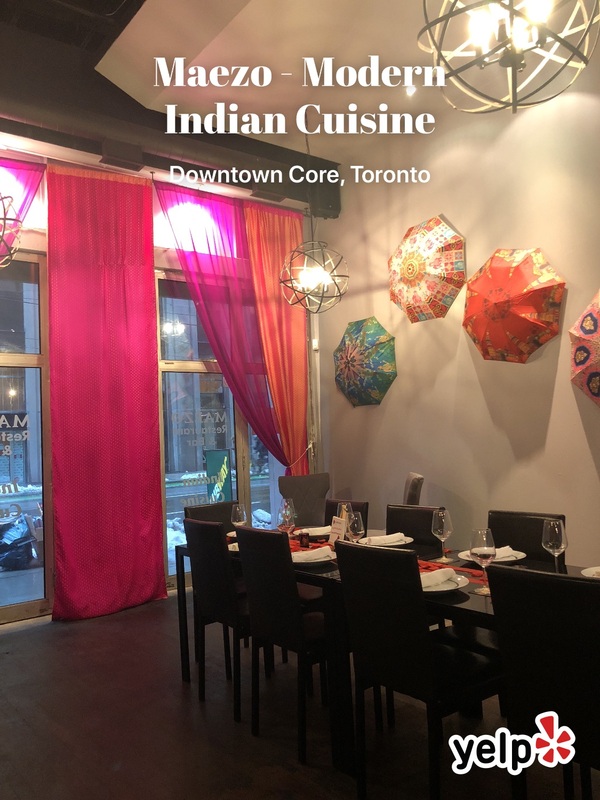 It was a bit pricy but the food was outstanding. 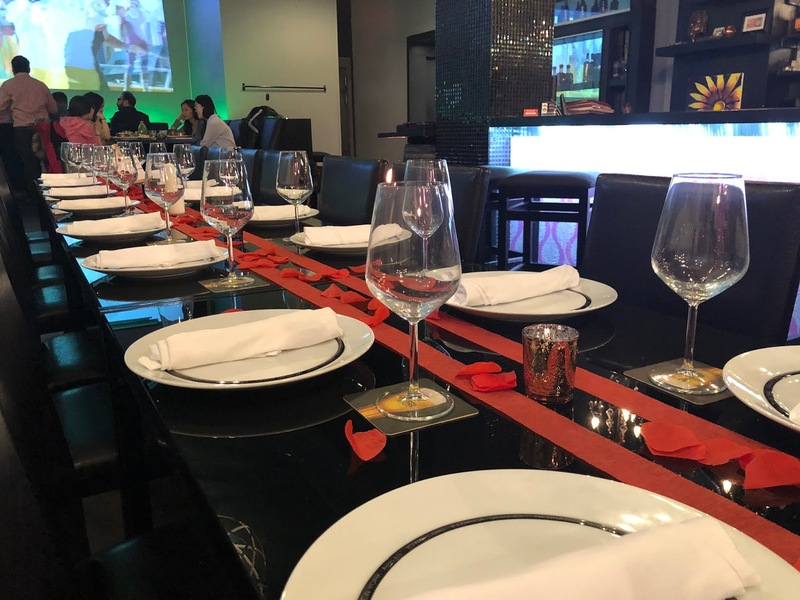 Service was great and the restaurant was very clean. Would recommend!